Congenital Sucrase-Isomaltase Deficiency (CSID) is a rare, inherited condition that has several names. It is sometimes referred to as Genetic Sucrase-Isomaltase Deficiency (GSID), Sucrase-Isomaltase Deficiency, Sucrose Intolerance, Disaccharide Intolerance, or Congenital Sucrose Intolerance. 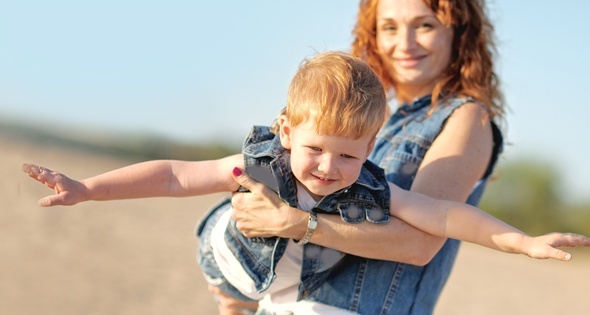 Congenital Sucrase-Isomaltase Deficiency, which can occur in males and females of all ages — infants, children, and adults — reduces the ability to digest (break down and absorb) certain foods one eats that contain sugars or starches. For this reason, enzymes like sucrase-isomaltase are called digestive enzymes. In people affected by CSID, the enzyme sucrase-isomaltase is either not present at all or has very low levels of enzyme activity in the small intestine. The small intestine is the part of the gastrointestinal (GI) tract that is just beyond the stomach and just before the large intestine. If you have CSID, your body cannot digest complex sugar or starches very well. If you cannot fully digest these foods, you may develop diarrhea, gas, bloating, and abdominal pain after you eat foods that contain sugar (white table sugar) and/or starch (for example, bread, cookies, crackers, and potatoes).1 Undigested foods in your GI tract are eaten by the bacteria that naturally occur in your GI tract, causing these symptoms (Figure 3). In the 1960s, Weijers and colleagues discovered a GI condition they named CSID. The condition was originally characterized by GI symptoms such as diarrhea, gas and abdominal pain after eating a meal. Figure 1. CSID can occur in males and females of all ages — infants, children and adults. An enzyme is a protein that makes the chemical reactions that occur all the time in the body occur much faster. We rely on the enzymes our body produces to help the tissues and organs in our body function normally. Sucrase is the enzyme that helps our body digest sucrose, which is a fancy name for white table sugar. Some digestive enzymes work in your small intestine, which is located just below your stomach, to digest (break down) food into simpler forms that can be absorbed into your bloodstream to be used to fuel the normal functions of your body. One of these digestive enzymes is sucrase-isomaltase, which breaks down some of the carbohydrates that you eat, such as table sugar (sucrose) and other sugars from starches present in foods such as potatoes and baked goods, into simpler forms that can be absorbed into the bloodstream. Carbohydrates are one of the three main sources of nutrients in our diets. The other two are proteins and lipids (fats). Carbohydrates are made by plants to store energy. Carbohydrates are complex compounds that must be broken down to a simpler form before they can be absorbed into the bloodstream. There are three types of carbohydrates. Sugars are simple or complex carbohydrates found in white table sugar, baked goods, fruits, vegetables, and dairy products. Starches are made up of more than one sugar unit bound together and are found in whole grains, potatoes, pasta, vegetables and beans. Dietary fiber is a very complex carbohydrate that your body cannot digest, so it passes through the intestine undigested, becoming a food source for the “good” bacteria that exist naturally in your large intestine. Fiber is present in fruits, vegetables, legumes, nuts, seeds, and whole grains. Sucrose (table sugar) is too large to be absorbed from the small intestine. 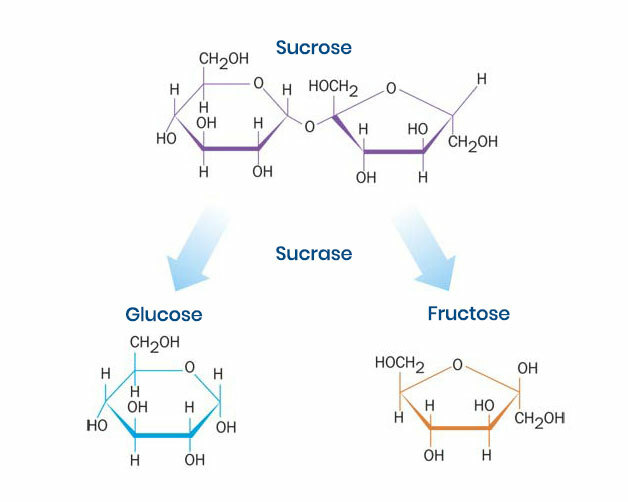 For this reason, sucrose must be digested to its simpler forms, glucose and fructose, before it can be absorbed into the bloodstream and used as an energy source (Figure 2).3 Sucrase is the only naturally-occurring enzyme in humans that can break sucrose down into its simpler forms. So, if you have CSID and the enzyme sucrase-isomaltase is missing from your small intestine or isn’t working or isn’t working well, you may or may not have GI symptoms after eating foods that contain starches. While there is only one naturally-occurring enzyme (sucrase) in our bodies that digests sucrose, there are multiple enzymes in our bodies that act to digest starches. Because only sucrase can digest sucrose, eating foods that contain sucrose usually causes worse GI symptoms in patients with CSID than eating foods that contain starches because some of those starches may be broken down in part by one of the two enzymes other than sucrase-isomaltase. Figure 2. Sucrose cannot be absorbed as is and is useless as an energy source unless it is broken down into its simpler components, glucose and fructose. What are the Consequences of Not Absorbing Sugars and Starches? Figure 3. Normally, sucrose is digested and metabolized (broken down) by sucrase (purple object) into two subunits, glucose (gold object) and fructose (pink object). These smaller sugars are able to be absorbed by the small intestine. 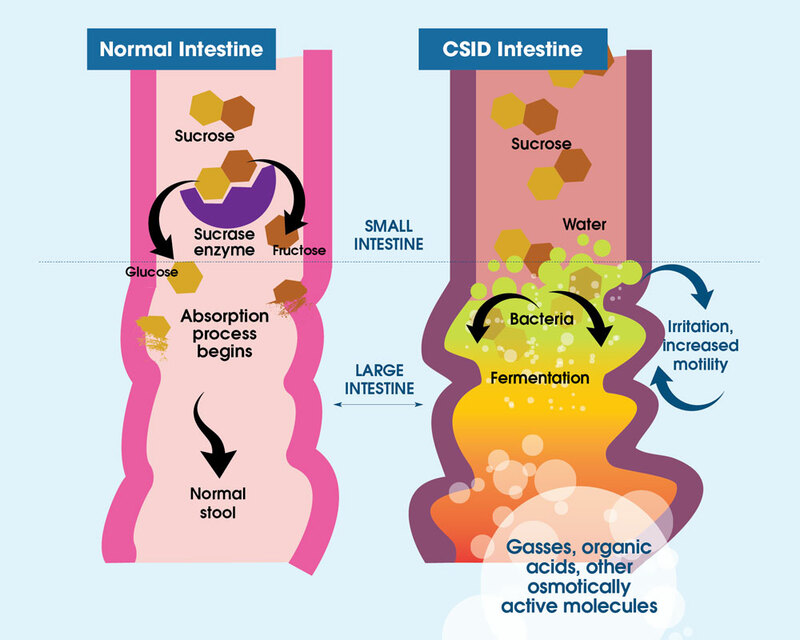 With CSID, sucrase is absent or not working well and sucrose is not broken down into its two subunits, glucose and fructose. As sucrose is too large to be absorbed by the small intestine, it becomes food for the bacteria, called microflora, that normally live in the large intestine. The way this microflora breaks down sugars is by fermentation, and the byproducts of fermentation are gases, organic acids, or other molecules. The presence of these byproducts causes abdominal distention (swelling) and pain, and the retention of water in the intestine, which produces watery diarrhea. Treem WR. Clinical heterogeneity in Congenital Sucrase-Isomaltase Deficiency. J Pediatr. 1996;128(6):727-729.